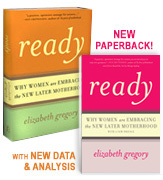 Happy to say, there’s a new version of READY on the way — due in August. This paperback (with spiffy new cover & Preface) updates the stats and analysis through 2012, with special attention to the recession effect (hint: the later motherhood trend continues, with lots of economic and political fireworks). You can book your copy by pre-order. Or buy a copy of the hardcover now, for yourself, for one of the later moms (or dads) on your gift list, or for someone considering becoming a parent someday.